There’s a problem when a store closes and you want to block out the ugliness that is an empty store. 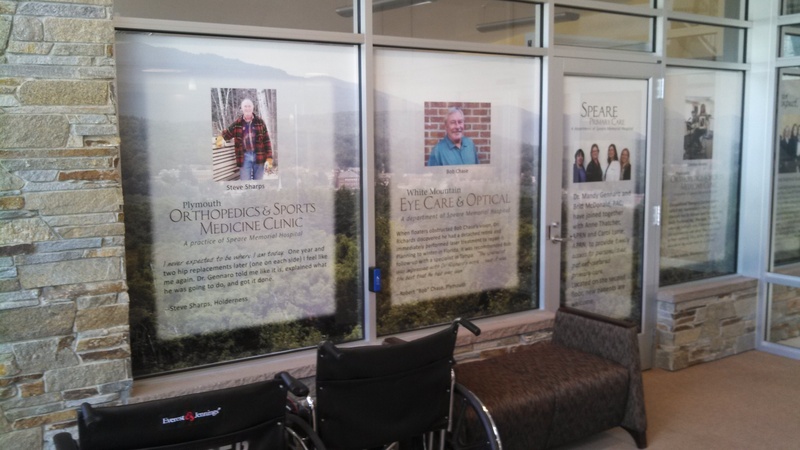 One of our customers solved this problem with large format prints that attractively fill the windows, and we were very pleased how good it looks. In this case, the store was a drug store in a medical complex. We printed foamcore mounted pieces that talk about the mission of the hospital and the services available. They put the foamcore pieces into the windows and it does a nice job of enhancing the experience of people entering the facility. We’ve seen people do this in malls, where the windows are larger, with vinyl banners and with adhesive backed vinyl. We also have a new product, ink side adhesive, that allows a paper print to be stuck “ink-side-out” on the inside of a window. It’s like sticky note adhesive, so it’s easy to apply and easy to remove. This entry was posted in large format printing and tagged empty store signs, store window signs, vacant store window. Bookmark the permalink.